‘Almost at rock-bottom’ was the phrase Ulster operations manager, Bryn Cunningham used to describe the latest bombshell to drop on Kingspan Stadium. The club confirmed yesterday morning that head coach, Jono Gibbes, would be leaving at the end of the current season. The 41-year-old told the News Letter last night he was returning to his native New Zealand not because of career choices but personal family reasons. 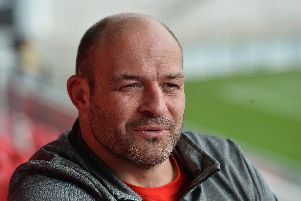 Coming as it does in the first year of a two year contract, a month after director of rugby, Les Kiss, left Ulster by mutual consent and two weeks after rumours that Gibbes was being touted as set-piece coach to the Australia National side, the timing could not have been worse. “I have been away from home for 10 years now and the time has come for me to prioritise things above my career. “Yes, I will need employment when I am home, I have three young children and I need to support my family. He added: The decision to leave here is a difficult one professionally, because I support the team and the staff, and I am excited for what the future holds for them. “I believe there are enough passionate and professional people involved to build on the existing strong foundations of the club. “The challenge ahead for Ulster demands the full attention of everyone involved; the management group, the team, the coaches and support staff. It is exciting and achievable. However, I cannot in good conscience provide my full attention for the journey ahead. However, he admitted that this season has left Ulster facing adversity on many levels but he insists that the Irish province can emerge from their current travails fortified for the challenges of the years ahead.